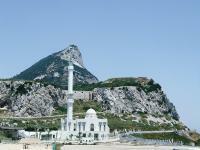 Gibraltar defences has been part of the Tentative list of UK. Spanish trains stop infrequently at the station at La Linea from where it is a short walk to the border. I walked across the border and entered the British enclave of Gibraltar from where I took a bus through the narrow streets of the town to Europa Point at the southernmost end of the peninsular. From here there is a commanding view of the Straits and North Africa beyond. Whilst the state party's description of the site is full of historical references, I found these hard to identify amongst the jumble of modern shops, banks and apartment buildings. I fact I found the town quite claustrophobic and lacking in OUV.